The light yet sturdy make-up of the Plumage stool is down to its ergonomic composition and ensures undisputed comfort. 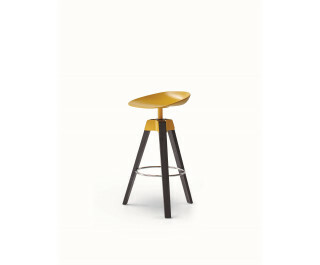 Designed by Dondoli & Pocci, the stool draws its inspiration from the shape of the Eiffel Tower. The sleek and slender shape of Plumage can accommodate the need for space and functionality in both the home and contract industry. Available in two versions of different heights, the stool stands out for its polypropylene seat, available in white, red, dove-grey, anthracite or yellow, and its metal frame, which matches with the colour of the seat itself. The legs are made of brushed ash-wood, in natural, grey or walnut finishes.